Home Tags Posts tagged with "lanzhou"
China National Petroleum Corporation – the country’s biggest oil company – has been blamed for water contamination affecting over 2.4 million people in Lanzhou. State media said Lanzhou’s environmental protection chief, Yan Zijiang, blamed it on a leak from a pipeline owned by a subsidiary of China National Petroleum Corporation (CNPC). The pipeline is now being repaired. Lanzhou is the capital of north western Gansu province. Lanzhou Petrochemical Co., is the subsidiary of state-owned CNPC believed to own the affected pipeline. The leak tainted source water for a plant owned by Veolia Water, a joint Sino-French venture and the sole supplier for urban Lanzhou, reported state news agency Xinhua. It added that authorities have warned that tap water contained up to 200 micrograms per litre of the toxic chemical benzene – 20 times the national safety limit. The authorities have since said the contamination has returned to safe levels in most areas. Exposure to benzene, often used in the petrochemical industry, can increase the risk of cancer and other diseases. 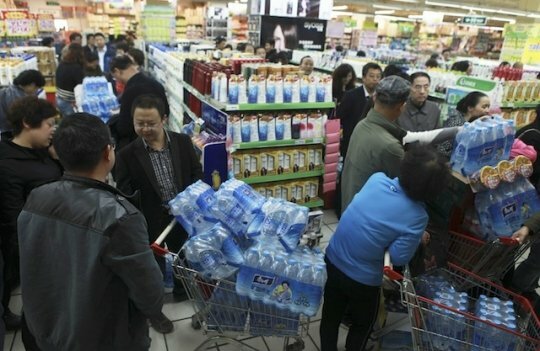 Shops are said to have sold out of bottled water. The scare has once again raised concerns over China’s environmental safety record.